St. Cloud was born in 522. The real spelling of his name is Clodoald, but translated to English, is Cloud. On the death of the King of Franks, in the year 511, his kingdom was divided between his four sons. The second of these sons was Clodomir. He was killed thirteen years later, fighting for his land. His youngest son was Cloud. When Cloud was eight years old, his uncle Childebert plotted with his brother, to get rid of the boys and divide their kingdom. The oldest son was Theodoald, and he was stabbed to death. The second was Gunther, and he fled in terror, but was caught and killed. Cloud escaped and was taken for safety into Provence. St. Cloud made no attempt to recover his kingdom when he came of age. 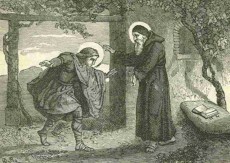 Cloud lived as a hermit and disciple of St. Severinus of Noricum. He was visited by many for his great, and compassionate counsel, and for his gift of healing. He eventually returned to Paris, where he was received with great joy. He had gained popularity for his gift of healing. At the peoples request, Bishop Eusebius of Paris ordained him a Priest in 551 at the age 29. St. Cloud established a holy place at Nogent-sur-Seine that is now a collegiate Church of Cannons regular, called Saint Cloud, where his relics are kept, nearly 1,500 years later. The village hosting his tomb was renamed St. Cloud, accordingly. St. Cloud in France, Wisconsin, Minnesota, and Florida are named in honor of this great Saint. He is their patron saint. St. Cloud was 8 or 9, when his father the King passed away. He and his two brothers were to all receive a piece of the kingdom, as it was being divided into thirds. His uncle, not wanting them to get anything, had them all assassinated with the exception of St. Cloud, who escaped at a young age, and lived as a hermit, joining with St. Severinus of Noricum. Eventually he was ordained a Priest in Rome, and had a miraculous gift of healing. All the people that would come from far and wide to seek his counsel loved him. His life shows us that even with a young family hardship, one can find peace in God and Holy Mother Church. He dedicated his life to serving the Church and lived a long life of service to others. He could have fought for his part of the kingdom, but he chose to serve God, and turn his back on the world, leaving the justice to God.